sComm has advanced face-to-face communication technology again with the revolutionary introduction of the UbiDuo 2 Text to Speech (TTS). This breakthrough communication device is the world’s first communication device with real time split screen text and dual text to speech for people who are deaf, hard of hearing, late deafened, speech impaired, and hearing. This ultimate communication solution allows two people to communicate in real time using either text, text to speech, or both at the same time. Try the only and new UbiDuo 2 TTS in the world whenever you need a solution to facilitate face-to-face communication between deaf, hard-of-hearing, late deafened, and hearing people. This revolutionary device with Text to Speech will help to eliminate bluffing, frustration and communication barriers, as well as promote communication equality. Use it to empower people to share their thoughts and emotions seamlessly in real time text and hear each other just as in a normal conversation. 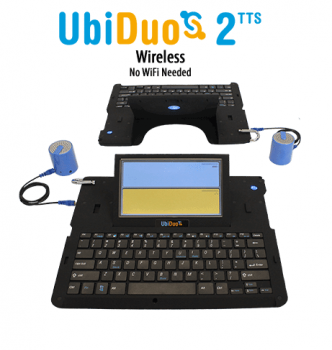 The only UbiDuo 2 with real time text and dual text to speech connects each half with a built-in proprietary networking protocol that has a range of up to 300 feet. The wireless system does not depend on Wi-Fi or the internet. You can use it in the middle of the ocean or at the top of a mountain. Internal low-powered, 2 Watt mono amplifier designed for typical headphones or externally powered speakers. Switchable speech mode enables to speak one word at a time, a phrase at a time or complete sentence.